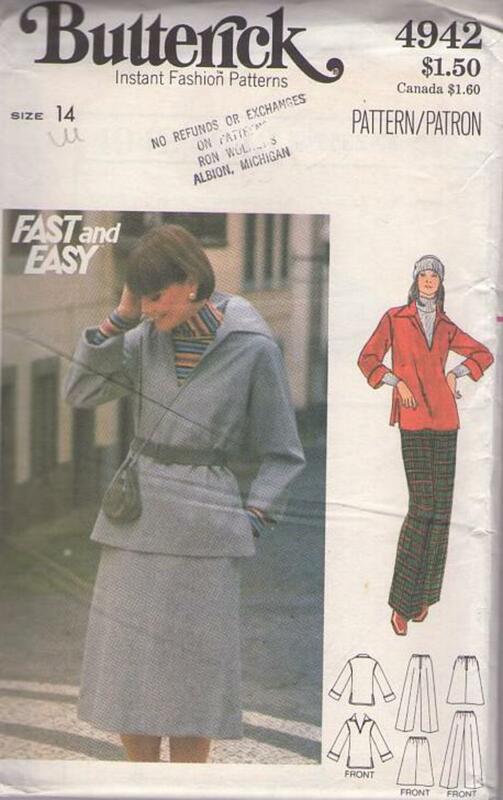 1970s, 70s Beginners, Retro Casual Clothing Patterns - MISSES' TOP, SKIRT & PANTS. Semi-fitted top has pointed collar, deep front neckline slit, slightly dropped shoulders, wide sleeves worn rolled up, side slits and topstitch trim. Four gore skirt, in below mid-knee length, with pockets in side seams and straight-legged pants have elasticized waistline and back zipper. Purchased shirts and belt.